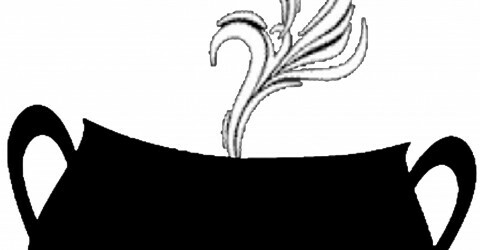 What Character are you playing in A Child’s Christmas in Wales? I’m playing Young Dylan Thomas. Is this your first production? NO, I was in Book-It Repertory Theatre’s Red Ranger Came Calling last Christmas. How long have you been performing, Sophia? Well, I’ve been doing plays – I think that play was last year – but I’ve been acting since I was 4. Have you done film work too? I did a lot of short films and I did some commercials and some tv things – last Friday night (Nov ??) I was on Grimm (NBC) – it was the pilot. Well, I like just being another character, like being someone who, not because – especially for this (Wales) – I play a totally different person, I’m a boy and I like to watch boys and I think it’s kind of interesting finding the differences between me and the character and I just like, especially in theatre, making people laugh and stuff – the audience – it makes me feel good to see people enjoying everything. Very thoughtful answer! 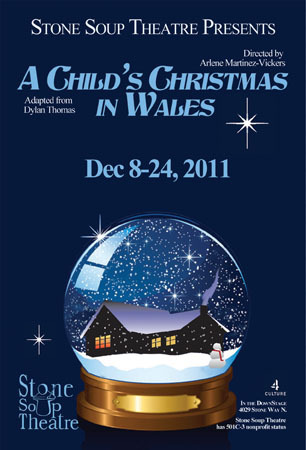 What has been your favorite thing so far about rehearsing for A Child’s Christmas In Wales? Let’s see – I think the storytelling part: we’re all telling stories it’s like a character being another character and really, the stories are kind of funny and I just like blocking with everybody, everybody’s so nice…yeah. Sophia Mitri Schloss is a 3rd grader at The Evergreen School. Credits include the feature films Ira Finkelstein’s Christmas and Desert Cathedral, Book-It Repertory Theatre’s Red Ranger Came Calling, and NBC’s Grimm. Watch Sophia on the pilot episode of NBC‘s Grimm, then come see her play Young Dylan in A Child’s Christmas in Wales this holiday season at Stone Soup! As the last few rehearsals dwindle down, to preview and opening night we look back fondly on mid-rehearsal, when we weren’t quite so polished. Check out Sophia, Guthrie and Stuart rehearsing the infamous candy “hymn” here.